Truly, the Black Hills is a paradise. This relatively small area contains five national parks and monuments, three state parks, two memorial mountain carvings, five recreational reservoirs, a national forest and two wilderness preserves, three national scenic byways, a national grassland, a national cemetery, two national and one state fish hatcheries, a wild horse sanctuary, ancient petroglyphs and nine major caves that offer a variety of tours. Black Hills, the Story Behind the Scenery, guides you through all the many facets of this wondrous and historically intense region. From the days of gold discovery and the raucous early towns such as Deadwood, right up to the modern excitement of the Sturgis motorcycle events, this lavishly illustrated book documents the interaction between man and nature in Black Hills. Add it to your shopping cart now. Filmed in High-Definition! 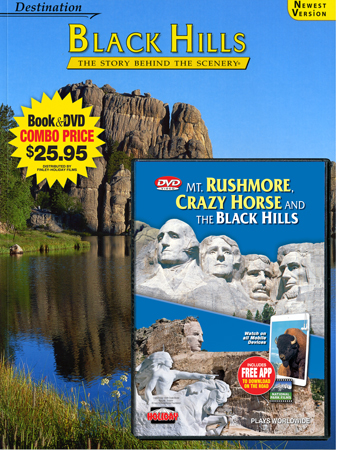 Experience the best of Mount Rushmore, Crazy Horse and the Black Hills of South Dakota with this all-new DVD, including a Digital Copy for all your devices. Explore state and national parks, Old West heritage, the 1880 Train plus fascinating historical footage from the archives of Mt. Rushmore and Crazy Horse Memorials. Discover the spectacular beauty of Custer State Park, Wind Cave, Jewel Cave and rugged Badlands National Park. Here, in a land still sacred to the Lakota tribes, legendary warriors like chief Crazy Horse and Major General George Armstrong Custer lived and died.